Alexander Technique lessons or classes are one-to-one and there are no exercises or postures to learn. The Teacher uses a range of simple everyday activities to explore a pupil’s individual patterns of movement and reaction. Gentle guidance with the hands and verbal instruction help calm the mind and restore the body’s natural reflexes. The props of a session typically include a chair, a table and a mirror. The Alexander Technique is an education, and therefore, classes are usually referred to as lessons or sessions. The practitioner is the Teacher, and the client is the pupil. Alexander lessons may involve practical applications of the Alexander Technique to a variety of specific activities like singing, reciting, typing, dance movements, yoga or playing a musical instrument. sessions normally last 30 minutes, and it is suggested that pupils wear loose and comfortable clothing. Embarking on a course of Alexander lessons is an education. And so there is no right number of lessons one must have. Typically, a pupil will have about 10 to 25 classes to get a basic understanding of how to apply their experience to everyday life. Some people find huge benefits in just having a small number of sessions. Why not follow the example of Keanu Reeves, Pierce Brosnan, Victoria Beckham and Sir Paul McCartney and learn the Alexander Technique. Costs of sessions at our London Studio in Mayfair vary and usually depend on the experience of the teacher. And of course, the professional and beautiful work Studio is a premium location. All the teachers at the Alexander Studio are highly skilled, and certified by STAT. Typically, sessions at the Studio cost between £50 to £100. Our Alexander Teachers hold a few limited places for concessionary fees. 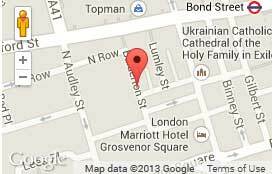 If you require Alexander lessons in London, W1, please contact us directly, at the Alexander Studio. We also offer Alexander lessons in East Finchley, North London.